Funds with high fees, and target date funds that charge a premium to invest your money in other funds. Want to avoid a shock down the road when your mutual funds underperform? Avoid the worst of the bunch. Image source: Getty images. A few weeks back, a family member reached out to me for some advice on choosing mutual funds for her 401(k). As we were reviewing the list of funds available to her, I realized how big a challenge it can be for the average person to make the best investment decisions for their 401(k), and just how many terrible mutual funds there are. However, that doesn't mean it's hopeless. The first step? Avoiding the worst funds. Here's how to identify the worst funds for your 401(k), and why you should avoid them. For years, it's been a relatively well-known fact in the mutual fund world that mutual funds that charge higher fees tend to underperform their benchmark. According to the S&P Dow Jones Indices SPIVA report, which analyzes the performance of actively managed mutual funds against their benchmark indices, more than 80% of actively managed funds routinely underperform common indices like the S&P 500, Russell 1000, and others, over the long-term. Using expense ratios to choose funds helped in every asset class and in every quintile from 2010 to 2015. For example, in U.S. equity funds, the cheapest quintile had a total-return success rate of 62% compared with 48% for the second-cheapest quintile, then 39% for the middle quintile, 30% for the second-priciest quintile, and 20% for the priciest quintile. So, the cheaper the quintile, the better your chances. All told, cheapest-quintile funds were 3 times as likely to succeed as the priciest quintile. The numbers don't lie: The most expensive funds are often the worst funds. Not only has this fund historically underperformed the Russell 1000 Growth Index benchmark it is measured against, it charges a 1.11% expense ratio to boot. In other words, you'd have paid a premium for this fund, yet lost out on about $3,000 for every $10,000 you invested in it over the past decade. On the other hand, the Vanguard Growth Index Fund Admiral Shares (NASDAQMUTFUND:VIGAX), which charges only 0.08% (as in eight one-hundredths of 1%), would have given you similar returns to the benchmark itself, minus its very small fee. This fund, T. Rowe Price Retirement 2050 Fund Advisor Class (NASDAQMUTFUND:PARFX), is supposed to be managed for those who will retire near 2050, and as you can see, the fund -- which charges about 1% -- has vastly underperformed the S&P 500. Yes, over time one would expect that it might underperform this benchmark, but with nearly 35 years left before its retirement date, this fund has significantly underperformed the stock market. Bottom line: Target date funds are great in theory since they will handle asset allocation away from stocks and into fixed-income instruments as you approach retirement. Unfortunately, the execution can be sorely lacking, leaving you well short of your retirement goals. This is an example of how easy it can be to pay too much for the exact same thing. 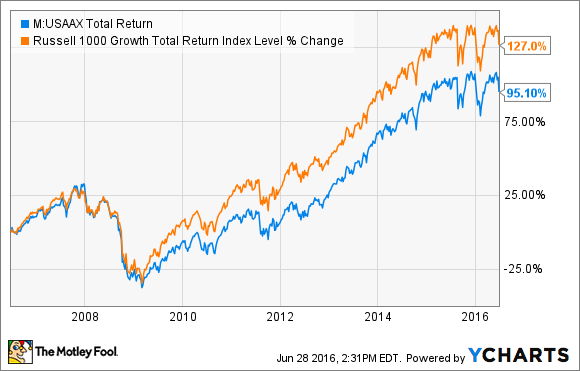 The chart above shows the returns of the S&P 500 over the past decade, as well as the total returns of two popular S&P 500 index funds, Vanguard 500 Index Fund Investor Class (NASDAQMUTFUND:VFINX), and Dreyfus S&P 500 Index Fund (NASDAQMUTFUND:PEOPX). 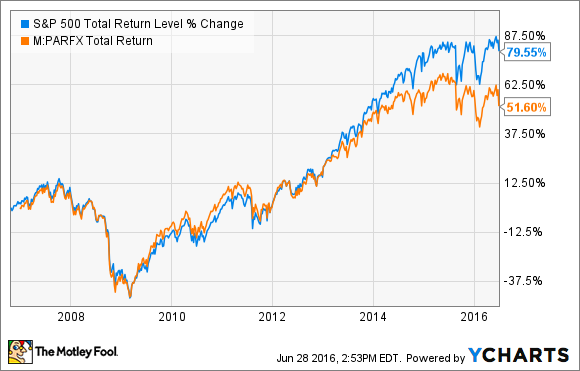 These two funds do exactly the same thing -- invest in the stocks that make up the S&P 500. But the impact of Dreyfus' 0.5% management fee, versus the 0.16% fee from Vanguard, would have cost you about $700 in lower returns on a $10,000 investment. That's a textbook definition of paying more for absolutely nothing. There are some exceptions to the "high fees equals low returns" rule of thumb, but they are few and far between. Furthermore, the impact of time will compound the lost returns, potentially leaving you with tens of thousands of dollars less when you retire. At best, you may have a little less extra money. At worst, it could mean you have to put off retiring for a few years to save more. 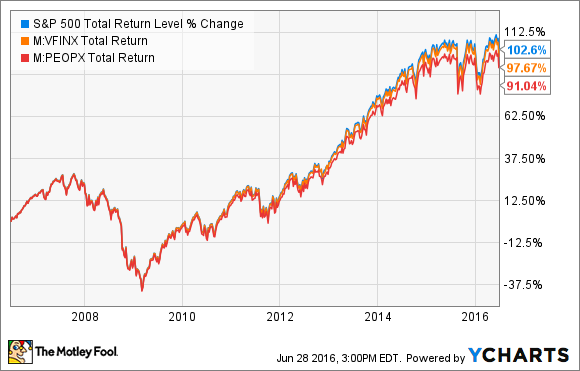 Bottom line: If you want to get the best returns you can, avoid the worst funds. And that's almost always the ones that charge the highest fees.